Vicki Keith was described as an unlikely athlete, not apt to succeed in any sport. In school she was last to be picked for teams. No matter how this made her feel, she refused to accept the negative comments made about her abilities. Today, she is one of the most successful marathon swimmers in the history of the sport. 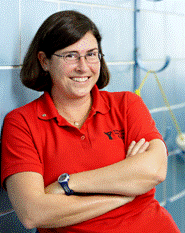 Holding many world records, Vicki has become, to many, the face of marathon swimming in Canada. Her most recognized accomplishments include becoming the first person to swim across all five Great Lakes in 1988, and for being the only person to complete the 104 km double crossing of Lake Ontario. The endurance aspect of marathon swimming covers a variety of evils including cold conditions, rough water, jelly fish, etc. – but for the unlucky, it may also include the occasional encounter with pollution. Vicki has encountered more than her fair share of oil slicks during her swims on Lake Ontario and during the Darling Harbor portion of her Australian swim. Vicki’s dream has always been to make a difference in the lives of people, so, in 2005, when the need for new opportunities for children with disabilities in Kingston, Ontario became apparent, Vicki came out of swimming retirement, and spent 63 hours and 40 minutes in Lake Ontario, completing 80.2 kilometers butterfly, setting 2 world records and raising over $200,000 for the Kingston Family YMCA. This brought her lifetime fundraising total to over one million dollars. Vicki Keith’s focus during her 40+ year coaching career has been to provide opportunities that help develop confidence and self-esteem while focusing on goal setting, leadership skills and work ethic. She believes that kids, able-bodied or with a physical challenge, require a place where they can relax, be themselves, be accepted, learn leadership skills and allow their personalities to shine through. Often, kids with physical disabilities have few opportunities where they can go to learn about, and explore their physical abilities. A coach and a strong positive sporting environment can make a hugely positive impact on these young people’s lives. They can help young people concentrate on abilities, not disabilities, focus on potential, not obstacles and identify possibilities, where others perceive impossibilities or road blocks. Vicki has been appointed as a member of the Order of Canada and has earned an honorary doctorate from Queen’s University in recognition of her outstanding achievements and service. In 1996 she was inducted into the Terry Fox Hall of Fame, and in 1998 she had her most famous arrival and departure point renamed after her. 1990 43 miles 24 hours Greatest distance in a pool 24 hours. I can’t believe I have never heard of Vicki Keith! Her accomplishments are unworldly! And that much butterfly?!? Is she part robot? Demi-god? Is this an April Fool’s joke?!? To say that I am impressed is an understatement!